Astro Boy (2009) | Anime etc. It’s sadly appropriate that a boy robot reject from a high-tech future world is the hero of a CGI cartoon that’s already flopped in America and Japan, the two countries he might call home. Astro Boy (Mighty Atom in Japan) is the first iconic hero of postwar manga and anime, created by the legendary Japanese artist, Tezuka Osamu. 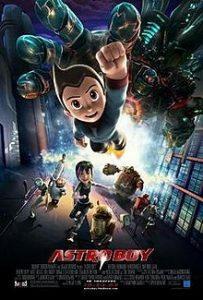 An android blend of Pinocchio and Superman, Astro Boy flies, has soulful anime eyes, super-strength, and machine-guns in his bottom. He was created in comics in 1951, had a live-action TV outing in 1959 and was animated (very cheaply) for TV in 1963. The cartoon crossed to America to become a hit “hidden import” which viewers assumed was American all along. The new film, made by a Hong Kong studio (Imagi) and a British director (David Bowers) reboots the character in the manner of Batman Begins on screen or Ultimate Spider-Man in comics. It steals from other films and cartoons with mixed results; it’s plainly inferior to its sources, but its brazeness is great fun for fans of animation and SF. Mainstream viewers, especially parents, may complain the film isn’t funny or witty enough, that some of its famous voices sound incongruous (especially an over-dignified Bill Nighy as a big-nosed boffin) and that it lacks the human heart of Pixar’s 2008 robot film Wall-E (which looks like the inspiration for Astro Boy’s junkheap Earth, except that animation’s long production schedules make this unlikely). On the upside, Astro Boy is a very decent junior SF adventure, and raises some surprisingly bold issues for kids who follow the story. This version borrows a lot from Steven Spielberg’s A.I. Artificial Intelligence (2001), turning on the robot’s rejection by his human parent. At the start, Freddie Highmore voices Toby, the genius son of a scientist (voiced by Nicolas Cage; Toby’s mother is excised in the usual cartoon manner). A few minutes in, Toby is tragically vaporised, a bit of a shock in a cartoon, though the film-makers quickly move on to his resurrection – or is it? – as Astro Boy is born from high-tech parts and a strand of Toby’s DNA-preserving hair. Astro has Toby’s memories, but his robot personality is evolving (a neat analogue for adolescence, though there are also shades of the cyborg characters in the anime Ghost in the Shell (1995)), and we wonder if Astro is Toby or not. (A philosopher might ask, what if Toby had left two hairs, which were put into two identical Astros?) The film puts more weight on Astro’s identity crises that his high-flying superpowers, perhaps because action spectacles cost more even in cartoons. There’s some lightly subversive politics – Donald Sutherland’s evil President plans a meaningless war – and a nod to literary satire. Astro Boy lives on a flying island-city, but later he gets thrown down to the rubbish-covered Earth. The plotline references both Miyazaki Hayao’s anime Laputa, The Flying Island (1986) – which is homaged through a giant robot character – and also the first Laputa in Jonathan Swift’s Gulliver’s Travels (1726), a floating kingdom dumping on the masses. The film’s animation is largely functional, though the simple retro-cartoon design is pleasant enough and Astro’s discovery of his robot powers as he zooms over clouds and through mountains captures some of the delight of the boy superhero in Brad Bird’s landmark The Incredibles (2004). Bird’s earlier cartoon, The Iron Giant (1999), is also pilfered for imagery as Astro tries, not very successfully, to be a pacifist robot, but there’s British humour in the mix too. A gormless trio of revolutionary robots recalls the People’s Front of Judea in Monty Python’s Life of Brian (1979), and the cartoon humour of Cosgrove Hall and Aardman, both studios with which Bowers worked before taking on this film.